2 hour marathon physiology // The sub-2 hour marathon: What physiology will it take? The other day, I did a post looking at the likelihood of a sub-2 hour marathon, inspired by an interesting article published in the Journal of Applied Physiology. That was part 1, focusing on the historical evolution of world records, not only in the marathon, but over shorter 10km and 21km distances, because I’m of the opinion that a 2-hour marathon will only be possible when the 10,000m times and half-marathon times improve by at least 30 seconds and 90 seconds respectively. So, contrary to the JAP paper, which suggested that the barrier would be broken in between 15 and 25 years, I think it will take many, many more years. Today sees the promised Part 2, looking more at the physiology, and specifically the running economy that will be required in order to reel off 42,195 m at an average pace of 2:50/km. It’s a conceptual post, so bear with the length and the “unanswerable” questions. And I must emphasize the point, picked up by some of you, that physiologically, our ability to separate a 2:03:59 from a 1:59:59 is limited. Both performances are close to the “limit”, and given that elite athletes are rarely tested and measured in the laboratory, and that the physiological variability is larger than the difference in performance we’re looking for, you won’t reach the end of this kind of discussion with a concrete answer. However, it’s an interesting process, nonetheless. Way back in 2007, we did a short series on Running Economy, the first post of which can be read here. 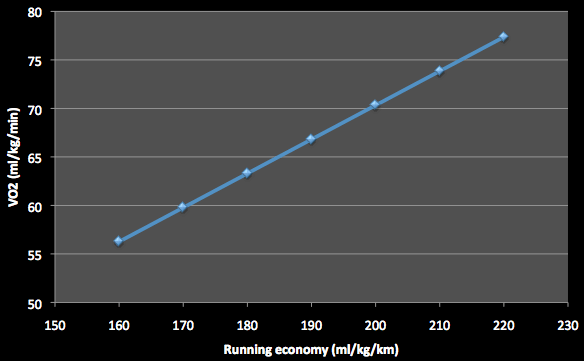 Running economy is a measure of how much oxygen you use when running at a given (sub-maximal) speed. The more economical the runner, the less oxygen is used, and this is crucial, because it is a characteristic of great runners that they are much more economical. The graph below, which is redrawn from a paper by Foster and Lucia (2006), shows the running economy of a few different groups of runners. Here, running economy has been measured as the volume of oxygen used per kilogram to run one kilometer (think of fuel economy in a car – one gallon takes you x-kilometers). So, the Europeans shown by the pink line in the above graph are using approximately 210 ml/kg to run 1 kilometer. You can convert this to the actual VO2 quite easily, if you know the running speed. For example, at 20km/hour, 1 kilometer takes 3 minutes, and so these European athletes are using 70ml/kg/min at that pace. The Africans, shown in red, are considerably more economical (this is one of the more interesting debates in physiology – there are obviously overlaps, but generally, African runners appear more economical than Europeans). 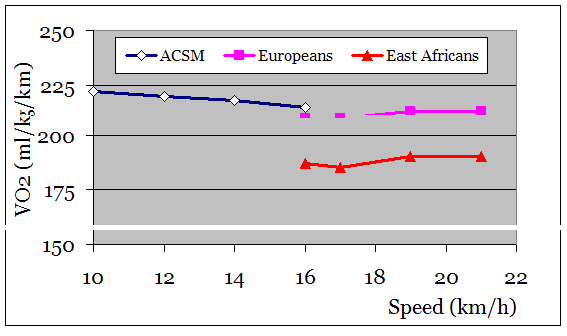 The VO2 of the Africans at 20km/hour is equal to 190 ml/kg/km, or around 63 ml/kg/min, about 10% lower than the Europeans. Can economy and capacity predict performance? So, knowing this, we can begin to project what kind of physiology is required in order to run a sub-2 hour marathon. The method used is very similar to that used for cycling, when we looked at the power outputs achievable during the Tour de France in our recent Tour coverage. There are of course assumptions that must be made, but as I tried to explain for cycling, if you make the “conservative” assumptions, you still produce an interesting picture of what is physiologically plausible. This is an exercise in theory, not proof. It is the first word in a debate, not the last, so bear with some assumptions and let’s see what the picture reveals. The first assumption that you have to make is what relative intensity an athlete can sustain for a given period, two hours in this case. This is not too much of a guess for elite athletes, but it does vary considerably with training – an elite athlete is usually able to sustain running speeds that require about 85% – 90% of VO2max for about one hour. Marathons are usually run at an intensity corresponding to approximately 80% of VO2max, while 10,000m is run at around 95% of VO2max. So for a two-hour marathon, we can make the assumption that the intensity will be equal to between 80% and 85% of maximum. Next one has to assume VO2max, the “capacity“. This is more of a lottery, because the range, even in elite athletes, can be quite wide. Zersenay Tadese of Eritrea was measured at 83 ml/kg/min, but some elite runners have been measured as low as 70 ml/kg/min (the reason they are still competitive, incidentally, is likely due to exceptionally good running economy). Nevertheless, using three assumptions, we can create quite an interesting picture of what the sub-2 hour marathon runner will look like, at least in terms of his ‘engine’. The graph below is the first step towards bringing all three assumptions together. It converts running economy into a VO2 (in ml/kg/min) at 2-hour marathon pace (± 2:50/km). Obviously, this picture is only partly complete. The next question to ask is whether an average VO2 of say 67 ml/kg/min for a marathon (at the running economy of 190 ml/kg/min on the graph) is reasonable or not? Can an athlete sustain that intensity for the required 2 hours? Obviously, this question is not answerable in theory, only through measurement, but we can get an idea of whether it is reasonable by asking what kind of maximal capacity is required for each of the above VO2 values to be reasonable. The graph below attempts to establish this. It estimates the VO2max of the runner for two conditions: One is that the athlete is running at 80% of maximum intensity (shown in red) or 85% of maximum intensity (shown in green). So, for a given running economy, you can now see what maximal capacity might be required, or vice-versa, given a VO2max, you can estimate the running economy required for two different conditions. The white lines show 2 examples. Example A is based on the measured economy of African athletes (including some Olympic medalists) who have a measured economy of around 190 ml/kg/min. At 2-hour marathon pace, they use 67 ml/kg/min. That athlete, running at 80% of maximum, must have a VO2 max of 84 ml/kg/min. If they were able to sustain 85% (which I don’t think is possible), they would have an estimated VO2max of 79 ml/kg/min. Example B shows the European athletes plotted in the very first graph of this post. Here, a running economy of 210 ml/kg/km requires a much higher maximal capacity; in this case, either 92 ml/kg/min (at 80%) or 87 ml/kg/min (at 85%). The point is clearly that in order to run a sub-2 hour marathon, the athlete requires BOTH an exceptionally good economy, and a high maximal capacity. I guess the third option is that they could get away with worse economy if they were able to sustain 90% of maximum for that length of time, but I don’t see this as very likely (but not impossible). Here’s the problem: With that kind of economy, Tadese would be able to run at a speed of 2:50/km while using only 53 ml/kg/min. Think about that for a moment: he is running at only 64% of his maximal capacity, at 2-hour marathon pace. He would be jogging to the world record if that was true. Even his 10km pace of ± 2:40/km represents an underperformance, because at that pace, he would only be using 56 ml/kg/min, or 68% of his maximum. We know that elite athletes run at at least 90% of maximum for 10km, which means Tadese should be sustaining a VO2 of 75 ml/kg/min, which, given his economy, predicts a 10 km time of just outside 20 minutes! Clearly, something is wrong with that picture. I actually emailed Carl Foster about this a while back, to ask about it, and he graciously replied, but then my computer got stolen, along with that email. So Carl, if you are reading this, feel free to chime in! I seem to recall that it had something to do with the timing of measurements – Tadese’s VO2max and running economy were not measured at the same time, and therefore using them together created a problem. 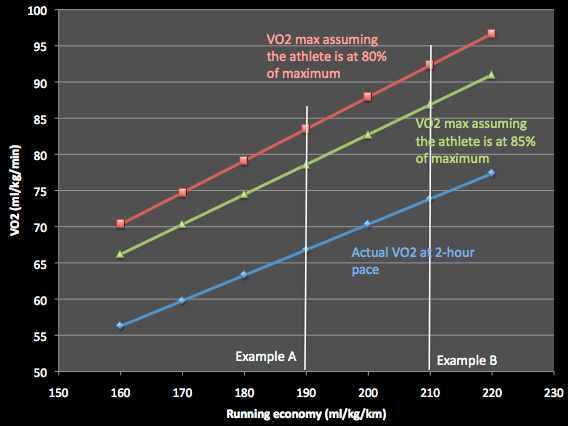 And this is crucial – when we make this kind of estimation, we’re assuming that VO2max and economy are measured together. And if they are, then the more economical a runner, the lower their VO2max is likely to be. For this reason, the combination of high VO2max and exceptional running economy is likely to be very rare. So, let’s get back to that graph above – does the athlete shown by “Example A” exist? Is there an athlete with such exception economy AND such a high VO2max? Or is the athlete with that economy likely to have a VO2 max closer to 70 ml/kg/min? That is a question I don’t have the answer to. What is clear though is that even now, the current world record represents physiology that is close to this theoretical picture presented above. That is, the current record equates to a runner with an economy between 180 and 200 ml/kg/km and a VO2max between 75 and 85 ml/kg/min. Both of these are reasonable assumptions, which would lead one to conclude that a sub-2 hour marathon is physiologically plausible. However, as I emphasized in my previous post, it’s not as simple as this. First, there are other “limiting” factors – thermoregulation is one that has not been mentioned yet. To run a sub-2 hour marathon requires significant heat loss to offset the heat production, and so the limit may well have little to do with oxygen use, and everything to do with the avoidance of hyperthermia. This factor certainly narrows down the opportunities to break the world record, because only a cool day will suffice – Dubai, Berlin and Chicago have all produced days that are too warm in recent years. As the 2-hour mark is neared, that becomes even more crucial, and that’s a big reason why I don’t think we’ll see more than one, small incremental improvement every five or so years. And then finally, I must stress that this ‘pre-occupation’ with VO2max and oxygen as the determinants of performance is only part of the picture. Performance is the sum of far more physiology than just VO2max and economy, and that’s why the best indication of whether that sub-2 hour performance will be possible is, in my opinion, to ask what the implications are for performance over other distances. If the shorter distances don’t improve, then the longer one is unlikely to, and you can go through this same exercise for 10km and 21km events and you realise that we’re right on the limit of physiological performance. Doping would shift that limit, yes, and perhaps training. But I still don’t see it happening within the next 20 years. Perhaps I will be wrong…as always, your thoughts are welcome! The limit of human performance: How much faster?